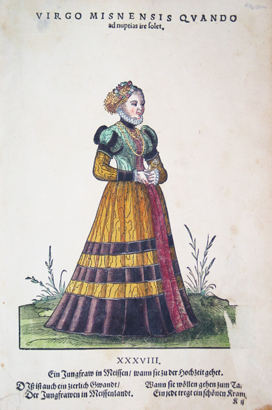 This is a late-period dress based on “Habitus praecipuorum populorum, tam virorum quam foeminarum Singulari arte depicti. Trachtenbuch: Darin fast allerley und der fürnembsten Nationen”, published in Nuerenberg in 1577. The dress construction is like the dress construction for Esperanza’s baronial investiture dress. The jacket is the same pattern as the bodice, only made a little larger. But since I am the incredibly shrinking woman at the moment, the jacket is already too big. The puff sleeves were made from a pattern. I am not pleased with the construction of the sleeves. I’ll have to use a different method on the next version of this jacket. I need to discuss the colors of this dress. They look a bit suspicious to me, as if this woodcut was colored in after the fact, out of period. I discussed this with Mistress Sophia Kress and she essentially had the same feelings. The dress and the jacket are not one piece but the coordinating vertical stripe is accurate. The photo below is by Wanda Ostojowana. Thanks, Wanda! I did not add the vertical stripe to the dress because the jacket is made from wool and the dress is made from linen. I wanted to be able to toss the dress in the washing machine. A note about the chains…in the SCA, a chain generally means that one is a knight. Unfortunately, German ladies wore lots of gold chains. The outfit would look wrong if I went without those decorations. So, I chose to be historically accurate and wear chains. I don’t think anyone would mistake me for a knight. Another outcome of this latest iteration of German garb, is my discovery that silk cut on the bias will actually stay on my head whereas linen slips off. The hat in the image was too complicated for me to make before the event, so I’ll have to make time later this year to tackle that project.